Meet a Critic: Roger Ebert! RT chats with America's favorite critic. Wishing him a speedy recovery from his surgery, we’re re-posting our Meet a Critic chat with Roger Ebert — Pulitzer Prize-winning author, screenwriter, and America’s most recognizable (and beloved) film critic. To paraphrase Roger Ebert himself, “I cannot speak, but I can write.” Although cancer silenced the nation’s best-loved film critic last year, Ebert (ranked by Forbes as the number one pundit in America) recently returned to the movies with a vengeance, publishing to his website an output of new reviews and Answer Man columns that puts entire fully-staffed newsrooms to shame. The qualities that made Ebert a critical celebrity for decades — his wonderfully dry wit, deft writing, and a yearning to be moved by cinema — of course remain intact, but while he’s currently aided by a speaking computer, he shares with RT his hope that he’ll soon recover his own voice. 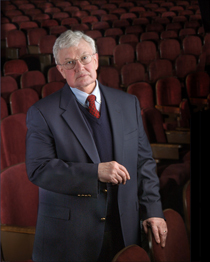 There are many reasons why Ebert is the heart of the critical community, and in the hearts of the moviegoing public. His influential review show, begun on public access television in 1975 with fellow critic Gene Siskel as Opening Soon at a Theater Near You, blazed a path for the celebrity critic by merging serious film analysis with America’s penchant for spectatorship. Ebert’s reverence for great films (and irreverence for bad ones) gave birth to the coinage of terms like “Dead Teenager Movie” and the idea of an “evil” zero-star film (see: Deuce Bigalow: European Gigolo). And as many know, everyone’s favorite critic penned a handful of delightfully camp B-movies with pal Russ Meyer: Beyond the Valley of the Dolls (1970), Up! (1976), and Beneath the Valley of the Ultra-Vixens (1979). Catch up with Roger Ebert in our interview below, and look for two of his forthcoming books (Roger Ebert’s Four-Star Reviews 1967-2007 due January from Andrews & McNeel, and a book on Martin Scorsese from the University of Chicago Press in the autumn). Roger Ebert: I am cancer-free, and looking forward to what I hope will be a final surgery in late January, in which I may regain the ability to speak. I attended the Toronto Film Festival and plan to be back at my own Ebertfest in April and Cannes in May. RE: Nope, I’ve got an American accent now. It came with the new Leopard OS for my Mac. Diving in: Why and how did you become a critic? RE: I wrote a weekly column for The Daily Illini at Illinois which sometimes involved movies, and did some interviews and think pieces for the Sun-Times before being named to fill the vacancy in April 1967. Before reviewing film you were a sports writer. How did that transition happen, and how would you compare/contrast the two fields? RE: I was a sports writer in high school, for my local daily. Not an intern, an actual staff writer. Both fields involve reporting on what you saw with a great deal of subjectivity and latitude in language and style. Fill in the blank: “If I wasn’t a professional film critic, I’d be an op-ed columnist or a professor of English literature. Which filmmaker (living or not) would you most like to meet, and why? RE: I’ve met most of the living and recently departed. Going back further, Buster Keaton, of course. RE: Citizen Kane. I know it’s the standard answer, but what can I say? I’ve taught it a shot at a time at least 40 times, recorded the commentary track, and could look at it again right now. RE: Alphabetically: Altman, Herzog, Keaton, Scorsese. RE: Too many to choose from. What’s the best movie you’ve ever written? (Beyond the Valley of the Dolls, Up!, or Beneath the Valley of the Ultra-Vixens) And where did your two noms de plume, R. Hyde and Reinhold Timme, come from? RE: BVD, of course. The pseudonyms came from Russ Meyer. It was no secret they belonged to me. Who do you think is a shoo-in come Oscar night? You have been well-established as a leading critic for decades. What are the most significant changes you’ve witnessed in cinema as both a movie watcher and a member of the critics’ community? RE: Film has become a marketed commodity, and the opportunities and audiences for art cinema have grown smaller. There is a general downturn in cultural literacy, perhaps because of television. How have you changed as a critic over the years? Do you think you become more lenient in your reviewing? RE: Some say I have. It may be that I tend to select better films to review. I hate the star rating system and refuse to keep count of my stars. When will we see you back in the balcony on Ebert & Roeper? RE: Depends on when, or if, I regain a television-quality voice. RE: Not insured, only trademarked. If it were up to me, they would have never gone away, but we’ve become mired in endless negotiations with Disney. Maybe they’ll be back soon. Do you have a favorite seat in a movie theater? RE: Toward the back, side of the theater farther from the main entrance. What’s your most memorable on-screen disagreement with Richard Roeper, Gene Siskel, or your previous guest hosts? RE: Nothing will ever top Siskel disliking Apocalypse Now. Which non-critic guest host did the best job of filling in on the show in your stead? RE: Not for me to say. What other film critics/bloggers/entertainment journalists do you read regularly? RE: A very wide spectrum. The critic I respect most highly is Stanley Kauffmann of the New Republic, and I wish you listed him on RT. Beside yourself, who is the sharpest critic working today? Who is the most influential critic? RE: 1. See above. 2. The NY Times, LA Times, Variety and Hollywood Reporter critics. What does it take to earn a 4/4 rating from you? RE: A very good movie. What else can I say? Has a film ever moved you beyond words? Specifically, are there movies you haven’t added to your Great Movies section that you just haven’t been able to find the words for? RE: I had a hell of a time dealing with The Birth of a Nation, and still haven’t taken on Triumph of the Will. No film has ever moved me in a positive way more than I could express, not even Tokyo Story. You have famously changed your mind on at least a few film assessments; The Brown Bunny and The Passenger come to mind especially. Do critics reserve the right to rethink a film’s merits, and how often has this happened to you? RE: Of course we do. If I’d never changed my mind in 40 years, it would be a sad commentary. You’ve reserved a special place for “evil” zero-star films like the recent Deuce Bigalow: European Gigolo and Chaos, but we remember in particular your 1980 review for a film called I Spit on Your Grave. How many zero stars have you given to date, and what does it really take to earn such distinction? RE: I haven’t counted, but in additional to being bad, the movie should be offensive beyond ordinary measure. What scope of responsibility does a critic have to guide his or her readers toward good films and away from not so good ones? RE: That is the critic’s responsibility. What is the state of current film criticism? RE: Flourishing, in great part because of the internet. Do you have a favorite review of your own that you’ve written in your career? RE: I’m pleased that I reviewed 2001 on the night of its first public screening, and got it right, when the initial reaction was largely negative. What words or phrases do you over-use? What is your most common concession stand purchase? What has been your most bizarre movie-going experience? RE: Clark Theater, Chicago 1968. Screening of A Hard Day’s Night, guy jumped at the screen from the balcony, screaming “I’m coming, John!” Minor injuries.